As we get into round three, it’s time to take some chances. Editor’s Note: Make sure you’re ready for your dynasty league rookie draft by checking out our 2018 Rookie Draft Guide, our current Dynasty Rookie Rankings and our convenient Rookie Draft Cheat Sheet. There are simply no better resources out there for dynasty fantasy football draft preparation. Make sure you also check out our 2018 Dynasty Fantasy Football Rookie Rankings: Consensus First Round and 2018 Dynasty Fantasy Football Rookie Rankings: Consensus Second Round to get all caught up. As we move into round three, owners are clearly going to start taking shots at their favorite sleepers or even some hometown players. After all, the obvious talent will be long gone after the top 24 selections. Solid dynasty owners who have been around the block a few times know better than to just waste these picks, though. There are bound to be some real steals at this point or later in rookie drafts and this is no time to stop researching players or trade these picks for little in return. The best dynasty owners value every selection and are mindful about every player they take, knowing that hitting on one of these players with a late round pick could swing the power of a league in their favor very quickly. As you read through this, make sure you read their initial rookie profiles, if available, to be fully informed about them before using your rookie selections. Be sure to keep checking in on our Complete Dynasty Rookie Rankings for constantly updated rookie values! This draft featured a ton of players (including many running backs) who landed in what are perceived as great locations for their fantasy value. Unfortunately, the tight end class didn’t fare as well. Goedert was widely regarded as the best tight end in the 2018 NFL Draft and the Eagles jumped in front of the Cowboys to grab him. If Dallas would have drafted him, he would have easily been a second round rookie draft pick. Instead, Goedert is stuck behind Zach Ertz, who is still just 27 years old and that pushed him down in our rankings. The good news is Philadelphia had two tight ends on the field for nearly 400 snaps last year and and also led the league in receptions by the position. All news from Eagles camp is stating they plan on using him early and often and the Eagles have also come out and said they would have likely taken Goedert in the first round had they not traded back and that simply can’t be ignored. While the presence of Ertz clearly diminishes his value, Goedert should eventually pay dividends – owners just may need to be more patient than they expected. So, I’m a premium member which includes rookie draft sheet (a huge reason I’m premium) yet consensus rankings are EXACTLY the same!! What’s the benefit? Frustrated!! I read every article, make notes. compare monthly adp. I live on this site. Try logging out and see what you can access………websites are not free to those who host one. Especially when their contributors are not willing to do so for free. If you can find a better site…….let me know. 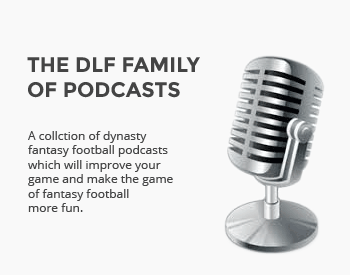 And no…….I am not currently a contributor for DLF but have had thoughts of doing so. Either way……….if you don’t like it…….then don’t do it! Myself, I like it! Yes……..it’s as simple as that! Let me walk you through the process a little bit here as I don’t think I did a great job of explaining it. When the draft is over, I ask our rankers to quickly get their initial rankings completed with a matter of hours on Saturday night or Sunday morning. From there, I use those rankings to create that Rookie Draft Cheat Sheet, which is a Premium product. These articles (also behind the Premium paywall, though you likely don’t see that if you’re signed in) are simply made to provide the information and context behind those very rankings so everyone can read up on our thought process and have access to those player profiles to learn more. They SHOULD be exactly the same because that’s how the cheat sheet is generated. It’s essentially one big project here. From here, we’ll take some time to mine through rookie minicamp and other information, see where the remaining free agents land and continue to monitor the happenings each and every day. I’ll update the cheat sheet with the consensus rankings likely at least two more times, after we see some movement worth reporting. In the meantime, the rankings are always evolving as our guys make any adjustments they see fit.